I can do roller coasters that go upside down as long as I don’t look at the ground when I’m upside down. Learned that the hard way! I love Space Mountain because it’s all in the dark. Last time I went, I got to sit in the front of a car and it was the best ride ever because there’s nothing to indicate which way the car will go. There seems to be a lot of overlap between stimming and sensory seeking. And I agree that there are some less than pleasant sensory experiences that I seek out too – especially spicy foods. Eating the same food for days, wearing the same blouse for ever, listening the same song for weeks, jumping over and over in the swimming pool or just floating until I turned blue…..reading 20 hours a day, riding the bike…I did all of these as I was younger, and I was…not happy but better than today. But in time the stress level rised so high That I ended somehow paralized, and I don’t want any kind of stimulus. Every new activity out of my daily routine gives me panik attacks. It is like I’ covering my ears, mouth and eyes. I don’t want to feel anything. If I only could live totaly disconected from my senses………But I am so happy I found your webpage. It helps me so much understanding myself, my past actions. I am 54, lived almost my entirely life in an est european country…even now Asperger is something almost unknown there. I got no help or guidance. I lived like any Aspie without friends and minimal social contacts. Your blog helps me so much! Oh, you hit on a bunch of things I do that I hadn’t really thought of as sensory seeking until just now. I’ll eat the same thing for the same meal weeks in a row, listen to the same short playlist on repeat every time I get in the car. I’m glad you found the blog and are finding it helpful. Since reading the writing of other autistic adults I’ve been slowly changing things for the better in my life or at least coming to understand better the things I can’t realistically change. I hope you find a sense of community here and that offers some comfort. I know how hard it is when there isn’t a lot of support or understanding for AS. It is realy hard. Not only because I have no social skills, but I live in a state where people are very unfriendly. But reading what other write here and on Wrong Planet realy open my eyes. I can understand me better, and already I start making small changes in my life. When I am very stressed out I forget all the good things that can help me. Today I was listening to the spa music, on my headphones, the whole day. Oh, gosh, yes I know what you mean about living in a place where people are unfriendly. When I find myself in a city where people aren’t very civil, I always find myself feeling emotionally bruised and tense and stressed out. I’m glad you’re finding places online where there are other people you can relate to and share with. It’s a huge help for so many of us to have that sense of community. I will listen to the same song ten times in a row sometimes. For me wearing the same clothing cuts and fabrics all the time is sensory defensiveness rather than sensory seeking. If I’m stressed or overloaded then I become hyperaware of my clothes and everything touching my skin. If I wear unfamiliar clothes then the unexpected sensations can push me towards getting overloaded, causing a kind of feedback loop. Eating the same foods over and over can be as much avoiding other textures and flavours as it is seeking the ones you like. I also find that often stimming behaviours can be stimulating one channel while blocking another – lots of forms of stimming by pressure can also involve going into the dark, for example. When I squeeze my head with my arms I’m stimulating my arms and squishing my head but also blocking my eyes, ears or nose (not that blocking those doesn’t cause it’s own form of sensory input). Well, it definitely explains my music preferences and why I prefer music that’s complex, with a lot going on between the instruments and the vocals, and inherently loud and intense without needing to increase the volume. Complex and intense sounds like it fits the bill! I would love to know how we’ve each come to be wired for our particular sensory preferences. I love rollercoasters, especially the ones that go upside down! It’s been ages since I’ve been on one. I used to crawl under mattresses as a kid, and I slept under my bed for a while. I have some very nice sheets now, they were cheap but I really, really like their texture, and I like to lie on my bed and stroke the sheet with my fingertips. Thank you. I probably don’t speak your language (unless you speak one of the minority languages spoken in that country). It’s nice to meet you! I speak german. Germans are a very small minority after 1990. There are no aromani in my country. I am a cocktail of macedonian, transilvanian and serbian. My Aspie comes from my mother’s line. She is serbian. Since generation all women coming from this line have a form or another of autismus. I remember one of my cousin…she spent her whole childhood sitting in the middle of the bed, in dark, roling a piece of her hair on her index. Most of the men have autismus too. It is so sad thinking of all my ancestors living this sad, isolated life. I always make a beeline for the roller coasters, even at Disney World. Oh, and I have flannel sheets that are so perfectly worn in now. It’s going to be a sad day when they wear through and I have to get a new set. Now that you mentioned the sheets, I realize I’m using the same one since october. I wash them ,, of course, but put them back! And my husband says nothing…….I think he has some Aspie too, he’s never aware of what is happenig arround him. Hahahaha! I have some flannel ones that I love, but my favourites are terrycloth. It sounds weird to have terrycloth sheets but they are actually really soft (not at all rough like my terrycloth towels) and the texture — soft but with little bumps — is very pleasing to the fingers. I switch back and forth between my orange terrycloth sheet and my blue terrycloth sheet as much as possible, but my other sheets get a little love now and then. I get stuck on songs, and then I have to listen to it again and again because the sound and the words and the colours are just right and they all fit together and I’ll listen to a song for weeks and not tire of it and then ever after I can remember “oh, it was spring 2004 and I was listening to “letting the cables sleep” by bush and that was before mp3 players and before i even had a cd burner so i carried my laptop around with me with headphones and listened to it all the time. and it was november 2009 and i was listening to ој девојче by Toše Proeski and it was april 2000 and it was Crucify by Tori Amos. And it was february 2013 and I was listened to L’Inverno by Vivaldi nonstop until I had a nightmare about it and I still haven’t managed to listen to it since which is really sad because the “up down up down up down firework firework firework” part was so fantastical. and i do get stuck on foods too. Winter 2007 it was rice and fried-and-breaded cheese and 3 dl of coca-cola every single day. And I have had pudding everyday for a few months now, because it’s so nice and filling and cheap and i eat it hot off the stove and sometimes i put a bit of cinnamon in and sometimes i eat it plain. I got distracted today and it cooled before I finished eating it and it was sad. This winter, I had banana milkshakes a lot until I tried to break it up by making an apple-oatmeal milkshake and it was so awful i couldn’t finish it and let it rot in the blender i was drinking out of and although i have since cleaned the blender i haven’t had the nerve to try using it again. I don’t think I’ve ever seen terry cloth sheets but I know the kind of fabric you mean. When my daughter was a baby, she had some little bath towels with hoods on them that were made of very soft, finely grained terry cloth. And what you do with songs, I do with work projects. When I see one of my finished projects, I vividly remember what was happening in my life, because I’m always dragging drafts around and working on them whenever I have down time. One thing is associated with jury duty, another with the ballet lessons my daughter took at a temple (I can still smell the kitchen where I worked while she took her lessons), another with her fourth grade soccer practice. And some of that stuff was 15-20 years ago. The associations never seem to fade. I look forward to the post on dissociation. Yay! I have notes for it and should have something written in a week or two. This is a huge problem for me. Really. I am a very hard worker, but when I get dissociated, I cannot function. I’m still jot sure I have asperger’s but I cannot get professionally tested until I get a job and reinstate my insurance. Even if I don’t have it, your posts are very helpful. I can truly relate to what you say, and I am gaining a level of peace from no longer feeling as if I am a fluke. It’s a big problem for me too and I’ve heard other folks with AS say the same. I get both physical and mental dissociation, often not at the same time, which is confusing. Yes. I used to limit my blog reading because I was too overwhelmed by the variety of blogs and I didn’t want to be seen as more than one kind of person. This time, after coming back from a two year break, I am starving for deeper answers. I am touched by the level of help available, simply from people’s guts and hearts, and not for any personal gain. We are truly sharing a journey. We who are dimensional, complicated, intricate, yet similar beings. I’m overwhelmed again, but this time, in a good way. I agree with you about how much people give from their hearts. I see it here in the comments and in other bloggers. I’ve learned so much–and continue to learn every day. It’s a good thing to be overwhelmed by! 100% LOVE roller coasters… I’d never thought of it this way, but it makes *perfect* sense. I’m absolutely sensory seeking. I once went to a camp that involved jumping off a 60 foot bridge on a zipline. High adventure? Sign me up. I love being thrown around in the air. A zip line sounds like great fun. I love the sensation of falling from heights, even though I’m terrified of heights. Personally I use ‘stimming’ to mean any behaviour I use to stimulate my senses. It doesn’t have to be particularly repetitive to meet my definition. For example every time I make myself mint tea, I huff on the tea bag while I’m waiting for the kettle to boil. This probably means I take a big sniff through it maybe twice before I use it in my drink. When I eat solid things I roll them around in my mouth before I bite. Depending on what it is that might only happen once or a small number of times in a meal. If I’m having to stand still, I’ll probably move from leg to leg. If I’m walking barefoot, I’ll probably tip toe (or if I’m happy skip sideways) but these only happen for as long as I’m having to do that. I think these are as much forms of stimming (stimulating my senses) as things I do dozens of times in a row. I’ve previously seen others saying that the difference between stimming and sensory seeking behaviours is that stimming is done absentmindedly while sensory seeking behaviours have intent. There’s perhaps some truth to that because I very rarely think ‘I’m going to find something to stim with now’, it’s more likely that I realise I’m already rubbing my arm on my face or that I’ve picked up one of the Tangles my home is full of. By this definition intentionally having an incredibly spicy meal or riding on a rollercoaster wouldn’t be stimming, but nor would be intentionally using a stim toy to calm ones self down in an overstimulating environment. So I don’t think I fully agree with that distinction either. Stimming feels nice and I often intentionally set myself up to do it when I recognise that I need to self-soothe. Riding a rollercoaster is a huge amount of vestibular and pressure sensory stimulation in one go, probably equivalent to rocking in foetal position for hours on end. I think the reason why I treat mint teabag huffing as stimming is that it totally overstims me in seconds, makes me feel light headed and wonderful. It’s like going on a smell rollercoaster. There’s no need to keep doing it, I’ve had my sensory high, if anything it would be too much. I get the same way from Olbas nasal inhalers, although I have found that if I have one in my pocket I do end up absentmindedly huffing through it every few minutes for more of a sensory headrush. I’d also say that what you call the body feeling ‘disorganised’ is my understanding of what being under stimulated on a sensory channel feels like. I’m really clumsy because I have very poor proprioceptive (muscle) sense. I have almost no sense of where my limbs are relative to my body and in space. When I’m tired, my limbs feel uncomfortable and restless and I have to move them around a lot to provide some of the missing proprioceptive feedback, or overcompensate by curling up in a tight ball or sitting on my legs and arms. I generally need to wriggle my fingers a lot of they also feel uncomfortable. Tangles are good for this. I’m oversensitive to sound, smell, light, taste, texture and pain but undersensitive to proprioception and temperature. It’s mixed about if I’m sensitive to interoceptive sensations, I am usually useless at spotting these needs but sometimes I’m oversensitive to certain body sensations. I think there’s either different channels there or some of them involve pain, which I’m oversensitive to. I’m also not sure about my sense of balance. I go through periods of having vertigo and being overly sensitive to dizziness, but that may actually be my vestibular system going and my vision taking over balance. I’d actually say that while it’s helpful to be able to list categories of senses, it’s probably misleading to actually treat them as discrete channels on which one can be either under- or oversensitive. For example, I think peripheral vision uses a different part of the brain to direct vision – I seem to spend a lot of time absentmindedly moving things in my peripheral vision, but don’t like to look directly at overstimulating visual input (I prefer to stare at static objects and maybe play with stereoscopic effects in patterns). I’m also not sure if pressure is a proprioceptive sense or a touch sense or a combination of the two or the same thing. According to Google, Hippity Hops have a lot of different names. And they come in adult sizes. I’m so tempted. It’s so hard to pin down a definition for stimming except maybe the infamous “I know it when I see it.” I find most of my stims and much of my sensory seeking is related to calming rather than stimulating, which is why I’ve always found stimming to be such a confusing and, for me, inaccurate term. I guess I basically “run hot” by default and need to put a lot of effort into downregulating my system. In that sense, going fast, riding roller coasters and all those other things are actually calming for me. It’s like setting off a firecracker or small explosion inside myself and releasing a tremendous amount of pent up energy that I can’t otherwise dissipate. You know, you and I should write a book about how different two people can be and still be on the same spectrum. 🙂 I can’t even say we’re on opposite ends of the spectrum or something silly like that because we have so much in common. I always look forward to your take on things because it opens my eyes to completely different possibilities. What you say about feeling disorganized being a sign of understimulation makes a lot of sense. I think that’s why the weighted blanket helps so much. It gives me a good amount of sensory input without being overstimulating. Hanging upside down is the same. So is getting a tight hug or creating pressure/tension in my joints or limbs. The curious thing is why it happens mostly when I’m overtired. My stimming tends to be mostly subconscious (or start that way) too. I almost always catch myself mid-stim rather than feeling that I want to stim or notice myself beginning to do it. I’ve tried using stimming consciously in difficult situations and that seems to work. But sensory seeking always feels like a conscious thing – I feel energy or tension or something building up and then go looking for a way to relieve it. I’ve been lurking around this blog for a few weeks, and it’s amazing how much I recognise. Except I wanted the sensation of flight, not speed, and would go 20 times in a row on the Pirate Ship or the super high swings. I haven’t done that in a long time now, but I totally would enjoy it again if I went. I’m glad you delurked and you’ve been enjoying reading here. It always nice to meet someone new! I’m definitly an olfactory and auditory kind of sensory seeker. I snif EVERYTHING and notice every smell. If it smell good, I start to snif the air without considering it to be weird, and if it smell bad or strong, I can’t breath anymore. But I can wear perfume, in small amount so I can’t snif it all day when I want to… I always wear a cupcake-perfumed scarf in winter (Yes, cupcake. I love sugar.) And it allow me to breath even with a bad odor in the air, like in the subway or the bus. As for auditory, I’m always on repeat mode whenever I found an interesting song or need to work and go into hyperfocus mode. I prefer metal and other kind of «full» music because light sound annoy me even more than light touch. I can’t stand the sound of bells, or the wooden guitar (no offense mean toward musicians! ).It’s almost unbearable and make me want to punch my ear hard or start some heavy metal to stop the sound. So Epic music or metal are the best because you don’t usually heard the sound of a bell or a wooden guitar in an Two Step From Hell or Kamelot song. And there is lot of intonations, variations of sound but not bells. Thus I’m an happy Aspie. And as for the other category, I can’t stand eating the same food days after days mostly because now it’s only sandwich and after 3 years of mayo-ham-spinach I getting a bit tired of it. But it’s mostly because I want to taste lot of delicious things as that I am a walking/talking stomach. I really hate tactile because it’s always annoying me or making me wishing I was something like a dead plant (just because nobody hugs a dead plant). Somehow it doesn’t do the get-away thing with my family but anybody else (including my ex-boyfriend) was freaking me out. And to conclude this afternoon of pestering the comment’s section: Yes I had this Hippity Hops thing when I was «little» (actually got rid of it two years ago… 15 years of pure happiness and one happy death in the hand of an twenty years old adult). And yes, it was fun but because of clumsiness, I had my lot of bruises! Oh my gosh, if I wore cupcake scented perfume, my sugar cravings would go into overdrive. I didn’t even know such a thing existed! There are some scents that I like but I don’t think I’m a strong olfactory seeker. I’m picking about tactile input and tend to seek it from nonhuman sources. Your dead plant analogy is a good one. Not necessarily a happy one but it gets the point across really well. This morning I was at the gym, doing some cool down stretching on an exercise ball and realized that it’s basically just and adult Hippity Hop. I think I’m going to pick one up this weekend to use at home. Wal-mart got almost every perfume in the sugar family! As for the dead plant, I usually use other vegetables metaphore but my english isn’t really enough for me to transform « j’aimerais être un poireau en hiver car personne ne pense à tenir un poireau gelé dans ses bras» in english without messing it up in a weird way (and google translate isn’t reliable either) so I just change it for something else. 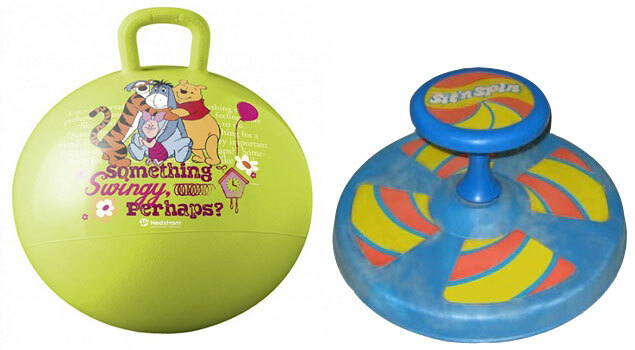 Those gym equipment were always a lot of fun, where I were going to the gym, because people were actually using them to mess around just like this toy! And we got weighted (is that even a word?) balls! The bad electronic music aside, it’s like a playground! The weighted balls are called “medicine balls” and my gym has them too. Playing catch with them is actually considered an exercise, which makes me happy. I’ve decided to buy myself one of the inflated exercise balls because, why not, right? Rusty french is a detail, still better than my english. I know the word leek, but weren’t able to make the link between the two… this happen all the time! It’s frustating! In french we call them balls or weighted balls, or simply «those things in the right corner of the gym» so thanks for giving me the right name! Playing ball is actually a sport? That explains half of what the people in the corner were doing. But most are really just messing around. Gosh I’m kinda envious of this ball you got yourself! Why not, after all =3! And yes, everyone is losing up time on internet. Gotta study before finals… *go back to Tumblr*. But yes in a way I was speaking about the way I usually say anything that goes on in my mind and I’m never sure if it’s pestering or just commenting! fantastic read. I can relate so much of this to my daughter. It gives me hope that she will find ways to regulate herself. She has just been diagnosed Atypical Autism but previously ADHD was mentioned I knew her constant movement was sensory seeking not hyperactivity and luckily our consultant sees that too. I’m not sure how old your daughter is, but I’d recommend lots of opportunities for her to engage in whatever sort of movement she finds most helpful as a way to help her learn self-regulation. It sounds bit counter intuitive, but the more I’m able to indulge my sensory seeking behavior, the less stressed I am and the less I seek out sensory input. Thank you for responding. we have a trampoline and a wobble cushion and we encourage spinning. The one we find hard to allow her to do safely is crashing into things and some of her verbal stims as she loves screeching. She is almost 6. We get sensory profile results tomorrow and hopefully some recommendations from OT. I recently saw an Occupational Therapist at my local specialist Asperger Service and did a full motor skills and sensory profile. I was very surprised to discover that despite having lots of what I considered to be sensory seeking behaviours like feeling textures and smelling things, I was still rated as less sensation seeking than the average/typical person. I came out as more than average on the other quadrants, and ‘much more’ for sensation avoiding. It makes me wonder if I underestimate how sensory seeking the average person is, or whether the sensory profile tool is flawed – perhaps only including typical NT forms of sensation seeking (or a combination of the two). I immediately clicked the links to the instrument thinking, “oh I’ll assess myself!” but it might as well be in another language for how complicated it is. Maybe when I’m less sick I’ll take another look and try to decode it, though. I’m very intrigued to know how I’d score. It’s interesting that your results surprised you. Maybe, in addition to the questions being geared toward NT sensory seeking behaviors, there is also the issue of how they’re worded. For example, there are some scents in a store that I would move away from but others that would attract me so in general I’d mark that question affirmatively, but for some specific scents I’d have a negative answer. There were also no questions about typically autistic sensory seeking activities like watching moving/spinning objects, using posture or body position (rather than just movement) for sensation, and nearly all of the touch processing questions seem to be focused on things autistic people typically avoid. Nothing about deep pressure seeking or touch-related stimming activities. So yeah, I can see it being a flaw in the instrument rather than a true assessment of your level of sensory seeking. Did you get recommendations as a result of the visit? I’m very curious about OT for adults because I think it’s one of the things that might really benefit me in a practical way. It’s a lot clearer and easier to both complete and mark the sensory profile if you’re working from the paper form rather than that online example, although you should be able to reverse engineer the questions and marking scheme using it. I assumed that ‘scents in a store’ meant the perfume section, which has been known to completely overwhelm me due to having hundreds of different perfume bottles and regular spraying of samples, so I marked the harshest possible ‘avoid’ answer for that one. I’m actually seeing the OT for (at least) five appointments total, for which I’ve so far had the sensory and motor assessments. I have another appointment next week for the results then (at least) two more to discuss strategies and actions, then at the end of it I get a full report listing my sensory profile, motor skills and recommendations for how to accommodate them. This is after I’ve already had several previous appointments with different specialists on the Asperger Team to work on executive function, emotional awareness and disclosure, so I’m really getting good value from the National Health Service! I did the assessment and came up with Much More Than Most on sensory sensitivity and sensation avoiding, Less Than Most on sensation seeking and More Than Most on low registration. So we have fairly similar results (fancy that!) and both feel that we’re quite active sensation seekers in spite of the less than average score. Hmmm. Oh, as a side note, I see that the scoring classifications are based on “the performance of individuals without disabilities”. I assumed that was referring to things like visual impairment, hearing impairment etc which would skew the results significantly due to limiting the ability to use those senses. I wonder if there’s an academic paper that describes the methodology and theories more thoroughly. Oh, that could be the case. Hadn’t thought of that. It would definitely be helpful to see the inclusion criteria for their validation study. Aha yes we’re pretty similar then, and both apparently less sensation seeking than people typically are. I am neurotypical, and what musingsofanaspie describes is far, really very far beyond anything that I experience. However it might be better to add, that, if there was something like a neurotypical spectrum disorder, and I actually think there is, I would be probably very low-functioning. So there might be a lot of in-betweens. So the difference between NT and aspies is far from being absolute. Tests show that people under immense stress very quickly develop copying mechanisms that are very similar to those aspies have. “neurotypical spectrum disorder” — WTF? I have sensory “cravings” and stims. I rock to calm myself down. I love to jump. Constant repetitive motion is my way of stimming. Like you I like fast motion and spinning and could do it for hours. I twirl my hair also to stim. As for sensory issues I enjoy strong sweet smelling perfumes and sweet smelling candles to the point people become offended. The strange thing is I can not stand other strong odors like coffee. I am very sensitive to touch. I freak out any time grass touches my feet and have issues with certain fabrics. Loud noises I sometimes enjoy other times I get very annoyed by certain sounds. My eyes are very sensitive to sun light and TV light. I’ve ruined more than one relationship by stimming/sensory seeking. It started with daily in-line skating after work for from 5:30 to 11:30 pm. Then mountain biking. Then road biking. Then skiing. Then fly fishing. Now at 46, at an age where most people would shy away because of the danger and physical demands, I’ve gotten into enduro (dirt) motorcycle riding. Dirt biking is what I’ve been “seeking” all my life, I think. The thrill from the speed, getting in the zone, execution of the various techniques, the danger, the physicality that leaves you completely exhausted — it’s all there. And the best part, it’s something you do with one or two other people, or alone. I even bring my dogs (very active breeds) and ride slow while they follow. That’s a win-win. Dirt biking sounds like awesomely good fun and a great way to tire out high energy dogs too. Can only take them sometimes. The speed gets way to fast on group rides or when I have the need for excessive speed. My daughter is 6 & is autistic. She is a sensory seeker. Loves to spin, jump, loves climbing. We have a tree that she loves to clim & she lloves deep pressure as well as light touch. I was saying to my husband the other day that I think she would handle roller coasters well. We took her at 3 years to Disney World & she loved all the kiddie rides. Now that I have read your post I will try her with a roller coaster ride. She just might! I didn’t get to try out a roller coaster until I was older (and the first time was a bit scary) but once I did I was hooked for life. Rollercoasters are so much fun! Although I can’t handle some of the spinny rides, they make me nauseous. Like that one where you stand up and it spins you around with intense gravitational pressure holding you in place. Martial arts is awesome. I loved the structure of the moves, the vibrations of connecting with the punching bag, and the flexing and strain on my muscles was so very relaxing in a weird way. I’m picky about loud noises and resulting vibrations. I don’t mind fireworks, but if something like a book dropped on a desk makes vibrations resound in my chest I get very cranky. There are different kinds of sensory seeking. I touch silky clothes, marble walls, pat dogs and cats. I do this again and again, and find it very soothing. I like putting a rubber ball between my knees and squeezing it because I feel the muscles in my thighs straining, and I like that. It’s fun to lift weights for that reason, too. I like to run as fast as I can because of the adrenaline, like to walk all day long for the lovely feeling of tiredness it brings, of total and utter exhaustion. love it. it’s fun. Love pressing the button on the bus that asks the driver to stop, love those large sensory buttons on the new buses. Love my brother’s chair with its padded arms that I run my hands over repeatedly and squeeze. Thank you so much for this site! I’ve only recently discovered that I am an Aspie. There are a lot of things I do that I realize now, are because of this. I scrape under my nails or if I can’t find something to use I’ll press them down on a hard surface. I didn’t realize I did this until it was pointed out to me but I like to take small rocks or bits of whatever, nothing larger than a BB but with rough surfaces, and rub it on the bridge of my nose. If I’m really stressed I’ll push air into my mouth to stretch my cheeks out, I usually pair this with holding my breath until I have to gasp in deeply and my heart is rushing. I have a long goatee which I stroke and pull and I love love love the sound of a single hair being rolled between my fingers next to my ear. Hi guys, I have a toddler (2 1/2) that displays much of what you describe. He craves speed, he asked to be thrown in the air as high as I can possibly toss him and pushed on the swings as high as they go. If I hold him as high as I can (on the swings) and let go he laughs uncontrollably while in a free fall till the swing starts climbing again. He also really enjoys the bumps in the sidewalk ramp for handicap people and rubbing different textures on his skin. He LOVES chewing on everything he can fit in his mouth, but especially likes the soft foam type material. My Wife and I are searching for some tips on how to satisfy his sensory seeking as we notices that every time we try to give him the sensory input he craves it just causes more problems. He gets extremely upset when it’s time to transition to something else.